My #1 pet peeve is seeing girls at football games wearing graphic tees with the team mascot or team name on it. Anyone under the age of 13 can get away with it, however, I feel we are just too old to be that nonchalant with our wardrobes, ladies. Now team colors, on the other hand, are your best friends. 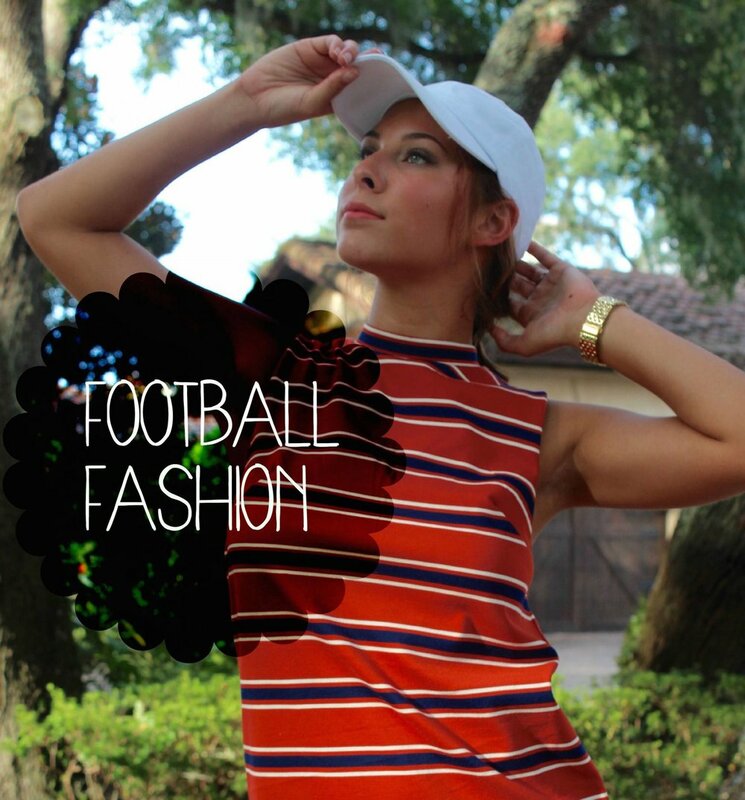 There are a couple key components to keep in mind when dressing for a football game. You are going to be tailgating and if your hometown is anything like florida weather, you probably want to wear the least amount of clothes as possible. You're going to be outside majority of the time, (unless you're sitting in a box) which means you shouldn't rule out getting your outfit a little dirty. If you've never been to the campus before, go explore! Walking down sorority and fraternity row and checking out all of the other sites the campus has to offer means your on your feet a looooottt; comfy, wearable shoes are a must! Lastly, no-one likes feeling sweaty strands of hair stuck to your face and neck, plan your hairdos according to the weather! Here are the outfits I put together that leave you football game ready (& yes, I planned them according to Florida colleges, hehe). Where the girls are the fairest, the boys are the squarest.... UF! T-shirt dresses are casual, comfortable, and cute. Perfect for outdoor activities that require a lot of moving around! Pair it with a ball cap and some walkable shoes & your ready for the big game! This dress seriously screams GO GATORS! Rompers are another casual, comfortable, and cute clothing item and I mean hey, what other type of outfit would we want to spend the entire day in? They're super easy to throw on, but even easier to style which is key. Even though rompers can be cute by themselves, plain ones like these need to be accessorized so they don't look too bland. I thought gold would be perfect to pair with this black piece because UCF colors are black and gold. Also, I feel like gold stands out more than silver and I know every girl wants to stand out at a football game. Boyfriend shorts are super appropriate for football games, in my opinion. Unlike regular denim shorts, the distressed parts on these shorts definitely make your outfit look more complex. When throwing on a solid tank-top or tee, you for sure need to accessorize it up with some bulky jewelry like this necklace Im wearing. The hairdo is the most important thing in this look. The braids on the side are perfect to keep hair from sticking to your face and to keep you cool. So, I know I haven't blogged in like over a week *cringes*, but I've come up with a bunch of posts to publish throughout the month and I'm going to put them all on a calendar so that I have posts weekly and don't go m.i.a. again. Comment below what your favorite college football team is!